If you travel over the holidays, it can be tricky to find activities on Christmas Day and New Year's Day. One trick we've learned is to look for zoos, ice rinks, movie theaters, ski slopes, and of course public parks. eileen @ FamiliesGo! on December 6, 2013 at 8:10 a.m.
i missed photo friday. glad it's back! Raj Kumar on December 9, 2013 at 9:51 p.m.
Hannah on December 10, 2013 at 12:05 a.m. Cute shot with your kid and interesting idea. Would probably get in a new section for the holidays. Exciting times ahead! Tonya on December 20, 2013 at 1:16 p.m.
My kids love to go ice skating. They're patiently waiting for our pond to freeze over so they can skate this year. James on January 28, 2014 at 4:24 a.m. The outdoors is never closed, so good choice on the skating! Susan Morris on January 30, 2014 at 2:57 a.m.
Wow... this is really nice. Even though the photo is a bit blurred, it captures the mood of day. Steven Garrett on March 6, 2014 at 5:03 a.m. Cute pic. 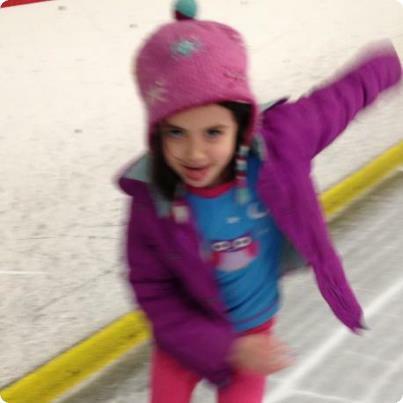 She looks like she knows what she's doing on skates, which far more than I can claim hahaha! Shiv Sharma on March 11, 2014 at 5:46 a.m.
Hey, nice pic with your kid....You had great time with fun activites...Shared good ideas for travellers to plan well ahead!